While it’s a wonderful, cherished tradition in many families to preserve food based on recipes that were developed and honed over the years in grandma’s, great-grandma’s and great-great-grandma’s kitchens, you should review those recipes, and if they don’t match recipes that have been tested and researched by food safety experts, you shouldn’t use them. 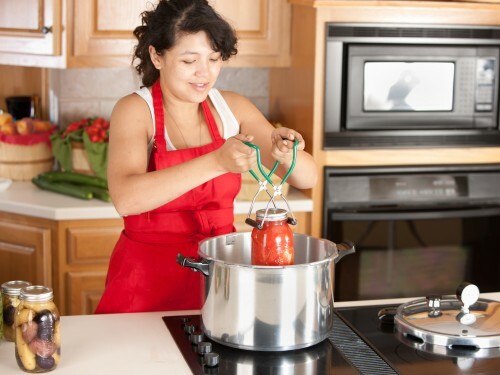 The National Center for Home Food Preservation is a valuable source for current research-based recommendations for most methods of home food preservation, says Kate Shumaker, an Ohio State University Extension educator and registered dietitian. OSU Extension is the outreach arm of the College of Food, Agricultural, and Environmental Sciences at The Ohio State University (CFAES). The center was established with funding from the U.S. Department of Agriculture’s Cooperative State Research, Education and Extension Service (now called the National Institute of Food and Agriculture) to address food safety concerns for those who practice and teach home food preservation and processing methods, she said. Precisely following the proper steps and recipes when home canning is important to help prevent botulism, a rare but potentially deadly illness produced by bacteria called Clostridium botulinum, she said. These bacteria are found in soil and can survive, grow and produce a toxin in certain conditions, such as when food is improperly canned, according to the U.S. Department of Health and Human Services. The toxin can affect your nerves, paralyze you and even cause death. That’s what happened in April 2015 when one central Ohio woman was killed and 24 others were hospitalized with botulism after eating potato salad that was made with improperly home-canned potatoes. “Canning season can be from late May, when your spring vegetables and fruits come in, through fall and into the colder months, when people want to can meat and soups,” Shumaker said. While canning is not really a complicated process, you do have to follow researched and tested recipes, she said. “Home canning is a science, but it’s not the time to experiment — you can’t make up your own recipes,” Shumaker said. “A lot of things can affect the safety of your final product. Additionally, CFAES experts offer hands-on classes on food preservation and canning in several locations around Ohio and have produced several YouTube videos on the subject. They also offer recipes and other resources for food preservation and canning at go.osu.edu/food-preservation and on Ohioline.